THE WOODLANDS, TX (May 4, 2017) – How difficult was the final day of the Carlton Woods Senior Invitational? Well wire-to-wire winner Jeff New began the day six shots ahead at 5-under and even though he shot a 9-over 81 to finish 4-over he still won by three shots. 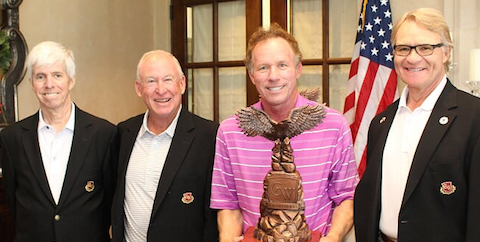 With the wind blowing and trouble lurking at the Nicklaus Course of The Club at Carlton Woods, New was able to hold it together just long enough to walk away with his first win in the event. A runner-up in 2014, New didn’t birdie a hole during his final round but his 10 pars were enough to push him into the winners circle. 2015 champion Lee Sandlin finished second at 7-over, Mike Peck was third at 8-over while Mike Booker and Michael Mercier shared fourth at 11-over. The low round of the day was a 1-over 73 carded by Jonathan Valuck who tied for ninth at 13-over.